Through our Resource Justice programme, we work to improve natural resource regime in which the rights, livelihoods and environment of host communities are protected while the broader Nigerian population benefits from mining, oil and gas. 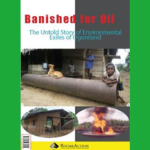 In Nigeria, the character of oil and gas extraction and mining of solid minerals have encouraged a social organisation that entrenches the destruction of the natural environment and community livelihoods, which breeds communal conflicts. The reliance on extractive revenues encourages massive corruption and damage to the national economy, social inequality and a regime of state repression. 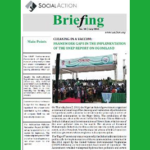 Social Action supports community and citizens’ actions to redress the negative impacts of oil, gas and mining investments and promotes recognition of the primacy of development needs of communities such as education, healthcare, water, income generation, human rights, security and grassroots democracy. We work to improve knowledge of community impacts of solid mineral extractions as well as building nationwide linkages and networks with petroleum issues and policies in Nigeria and enhance community participation in the natural resource regime through strengthened Community Advocacy Centres. We also Work with communities to protect livelihoods through mitigating adverse environmental impacts of oil and gas extraction. 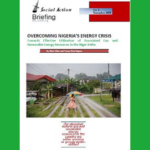 OVERCOMING NIGERIA’S ENERGY CRISIS: Towards Effective Utilisation of Associated Gas and Renewable Energy Resources in the Niger Delta. 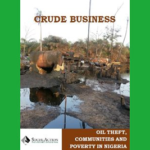 Crude Business : Oil Theft, Communities and Poverty in Nigeria.